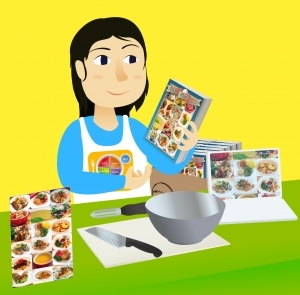 We just received a question from a reader about how to start a cooking demonstration program. 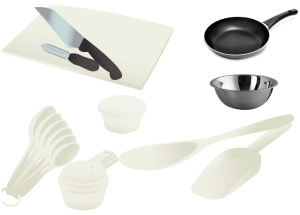 Which cooking equipment do you recommend for doing cooking demos? 1) You need to use what consumers are using in their own kitchens so they walk away with an ‘I can do this’ attitude. While a copper gas stove is entertaining on the Food Network, a simple kitchen setup is better for consumers who want to learn to cook healthy. Use equipment they already have and what you are used to using yourself! 2) Simple is just better for speaking and working in front of a live audience in a demo kitchen atmosphere. –Microwave – this is a must for us and we have done demos using just a microwave – you can cook anything in it – even pasta in boiling water if you must – we have even baked a cake in one! And we actually prefer to have 2 microwaves in a demo kitchen (and even our own kitchen) so you can keep moving and keep the audience interested. But most important is that it is easy to cook vegetables and even fruits in a microwave! Vegetables cook fast and with little water in a microwave so they retain better color, texture and nutrients. There is less mess when using a microwave for steaming and you can often cook, serve and store the items in the same glass dish. Of course a real range with a stove and oven is even better. pressure cooker or instant-pot because it cooks many things in 10 minutes or less including soups, potatoes, vegetables, grains, protein, and some legumes (many legumes cook in 20 minutes or less with no soaking needed! a rice cooker – we find this item makes cooking brown rice so easy that people are inclined to do them over and over and over. And you can cook other whole grains in it. The best part about a rice cooker is that it cooks rice and other grains perfectly and you don’t have to stand over a stove stirring. You set it and forget it. Where would we go to buy equipment and small wares? Walmart or other discount stores, department store sales, Amazon or a local restaurant supply store. We have picked up very nice items on Amazon and enjoy reading everyone’s reviews. Consider a portable “island” cart that has wheels, a counter top, and drawers and cabinets. You can use it for storage when not teaching classes. And it can be pushed out to become the demo table for class time. Just make sure you lock the wheels so it stays put while cooking. If you are teaching an interactive class be sure to have a few work stations and to split your group into teams of 2 to 4 so they can each make a recipe. It is always good to give each group a different recipe because they will learn everything by doing it and observing others. As food and nutrition professionals and public health educators, we recognize the importance of knowing our way around the kitchen to improve health. We recognize that eating meals away from home increases calorie, fat and sodium intake and reduces fiber, vitamin and mineral consumption. ( 1 ) But how do we convey the need for cooking interventions to the populations that need them most or potential funders of such programs? Despite the popularity of cooking shows, food magazines, and social media sites devoted to food and cooking, what does the research say about their impact on patient compliance or healthful behavior? A recent study published in the Society for Nutrition Education and Behavior reviewed studies conducted from January 1980 to December, 2011. The review looked at how effective interventions were that included cooking and home food preparation. Outcome measures included nutritional intake, knowledge/skills, attitudes toward cooking, self-efficacy/confidence and health outcomes such as BMI, changes in lipids and PSA in one randomized cooking trial with prostate cancer survivors as subjects. Of the 373 journal articles and 85 educational materials identified, there were 28 appropriate studies identified; 12 that had a control group, 6 as nonrandomized and 6 randomized. In 5 studies, postintervention was provided, pre- and postintervention was done for 23 studies and 15 studies included information beyond postintervention. Both qualitative and quantitative outcomes pointed to a positive effect on main outcomes, but due to the lack of rigorous study designs, different study populations and non-validated evaluation tools used, stronger conclusions could not be drawn. Some of the more successful studies showing positive impact included pre, post and beyond post intervention. Questionnaires including eating style, pre VS post nutrition education, cooking skills and changes in dietary intake and behavior were used in several studies. Populations varied from U.S. university students, Aboriginal people, South Asian community members and Head Start parents. Nineteen of the studies reviewed looked at the effect of cooking classes on dietary intake. Although study designs were variable, 16 of the studies showed a positive impact on food consumption. While there is not a lot of high quality studies on cooking interventions the ones that are successful teach multiple classes. A minimum of 5 classes seems to be a successful format. Perhaps weekly or monthly classes over an extended period of time can be the most helpful. Adding newsletters and phone calls appears to be helpful. Grants for school gardens, cooking classes and cafeterias can be found at http://www.beginningfarmers.org/grants-for-school-gardens-curriculum-cafeteria-cooking-classes/. Finally, www.grantwatch.com is a catch all site you can search to find food and nutrition grants in your backyard. If you really want to polish your skills consider one of our books, a salad theme, or our new upcoming webinar, 10 Successful Strategies for Cooking Demonstrations. Got a question? Ask us! Do you have an audience who needs to eat more fruits, vegetables, and legumes? Perhaps they have picky tastes or they do not know how to cook and plan meals? Or maybe they love to cook and they are looking to you for inspiration and healthy eating ideas? Whatever the cause, a cooking demo is a great way to help people learn to eat healthfully. They can be used as part of a wellness program, for marketing a program, or in a classroom setting. You don’t even have to heat anything you can make salads, snacks, and desserts without cooking. Of course you can also go hog wild and cook a few dishes or meals. Chances are you have a few favorite dishes and cooking techniques that others will want to learn. There is a reason why most parties end up in a kitchen! But if you want some great ideas you are in luck! Here are new ideas for 2018 for fabulous cooking demonstrations. InstantPot – I have a friend who likes to work very hard and very late in her dental practice. She is a total foodie who loves to cook so she is not giving it up but she is doing it faster! She actually owns two InstantPots and is cooking all of her meals in them. On the day that I visited her kitchen she was slowly cooking a turkey breast in one and a soup in another one. It is all about hands free, fast cooking. Salad – Develop your own delicious salad using local seasonal ingredients. It could be fun to assemble and prep a bunch of salad fixings and allow people to come up and make their own concoction. Or maybe you want to have a salad challenge on your social media channels. Dessert – everyone loves dessert. Why not make up some great fruit desserts? Our favorite is banana split with fresh bananas, chocolate sauce, whipped cream, and toasted nuts. Or you can make a fruit soup with blended fresh fruits. And if you really want something clever consider our all-time classic apples with Greek yogurt, honey, and toasted nuts! Bean tour – what can they do with canned and dried beans? Why not have a bean bootcamp to make soups, chili dishes, dips, and salads using canned and or dried beans? These cook really fast in a pressure cooker or InstantPot and canned are always easy, too. Our favorite lentils cook in just 20 minutes without soaking. Equipment – maybe you are a total foodie and have some really neat well-vetted equipment or tools that are very useful. You could have a day where you review equipment and how to use it. Of course this could be as simple as a peeler, knives, and a cutting board. Or it could add in InstantPots, microplane graters, Japanese mandolins, food processors, and a variety of steamers. Or maybe it is all about what a rice steamer can do? or how to wash greens in a lettuce spinner? Local foods – Did you know that millenials are fast becoming part of an $8 billion local food industry? Check out local foods at various markets and farmer’s markets and show how to make what is in season right now. Regardless of your topic, don’t forget your audience’s skills, culture and budget and remember to consider what your facility looks like. But most importantly be yourself and don’t worry that your ideas and skills won’t impress. Each person has a unique way of cooking and everyone loves to learn a new idea or way of doing things in the kitchen. or our new upcoming webinar, 10 Successful Strategies for Cooking Demonstrations. Now is a great time for a cooking demonstration or two. Are you ready to rock a demo of your own? 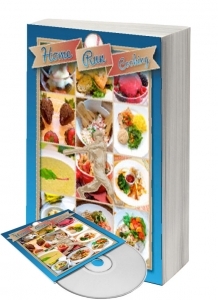 If you’re not sure where to start, then check out this selection from our new book, Home Run Cooking and Demonstrations, by Judy Doherty, PC II. 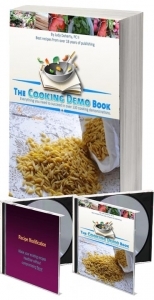 It has everything you need to know about putting together a successful and engaging cooking demonstration. Remember, those details matter! Read the recipe through in its entirety and make sure that each step is clear and makes sense to you. Gather your equipment. 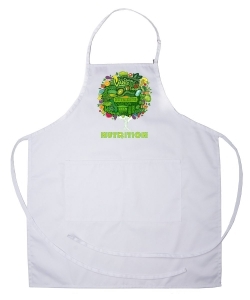 Will you be able to puree the soup on site? How? Small batches in a blender work well, as does placing an immersion blender right in the pot. A food processor works well too. Practice with these machines so that you look smooth during your demo and so that the soup does not spray everywhere because of a lid that doesn’t fit. Purchase your ingredients. Any soup demo lends itself well to a discussion of the sodium content of canned soups. Homemade soups are fresh, healthful alternatives. Pick up a couple cans of different kinds of soup so that you can discuss sodium content during some downtime in the demo. Print any handouts or recipes that you want to distribute to the group. Practice your demonstration a few times. Try to get family or friends to watch you and offer feedback. Visit your demonstration site and ensure that all equipment there is ready to go. If your audience is large and you want to provide tastings, you can precook a large batch of soup ahead of time. Pack up your ingredients and equipment. Review food safety information to be sure that you have proper temperatures and materials for hand-washing, area cleaning, and sanitizing. Pre-measure all ingredients and place them in small cups or bags on your demo table. Put them in the order they will go into the recipe, with the first ones closest to you. Introduce your ingredients and talk briefly about any notable ones. 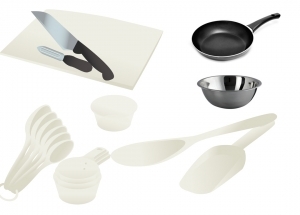 Introduce your cooking equipment and each piece’s role in the recipe. Outline the process you’re going to use to prepare the soup. During the downtime in your demonstration (or before/after the presentation), you can discuss the sodium issue with soup. When the soup is done, puree it. If you’re distributing samples, do so now and discuss the recipe with participants while they eat. The most important variables for soups are the texture and the temperature. Cooking properly will assure a smoothly pureed soup. Test the veggies with a knife or by tasting them to make sure they are soft and ready to puree. Make sure you serve a hot soup hot and a cold soup cold. Do not be afraid to adjust the consistency with a little more liquid if needed. Since this soup can take a while to cook, you can also prepare a batch ahead of time (batch A), and then demonstrate the recipe (batch B) during your session, stopping just before you get to the long simmer. At that point, you can reheat and distribute samples from your earlier batch (batch A). If you don’t want to miss demonstrating how to puree the soup, then you could leave your first batch of soup (batch A) un-pureed. 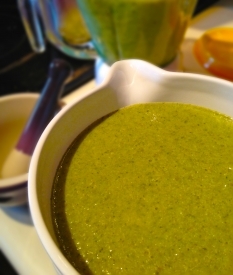 You could demonstrate how to make the soup up until the long simmer (batch B), then reveal your first batch (batch A) and run it through your blender, immersion blender, or food processor before distributing it as samples. Use the Fooducate app or website to grade various canned and prepared soups. This can be a demonstration or a group activity. Garnishes can also make or break a soup. Brainstorm healthful topping ideas as a group, and consider bringing some options to class ahead of time. Like what you see? 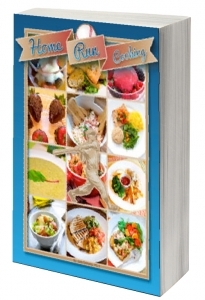 Get the cooking demo guide! It’s National High Blood Pressure Education Month! When you’re giving a cooking demonstration, the way you present your ingredients can really make a difference in audience engagement. If you have things haphazardly tossed into bowls and plates, or even just zip lock bags, the instructions won’t be as clear and you won’t look as professional as you could. Gather pretty prep bowls and other items that will make your presentation ingredients look more appealing. Be sure that all your tools and ingredients are ready to go before your class arrives to view the demonstration. We loved these towers so much that we even pinned them to our list of favorite kitchen equipment on Pinterest. Check us out at http://pinterest.com/foodandhealth!